As coaches and players ramp up to compete in the 2014 football season, brands are doing the same. Advertising partners of the National Football League are busy finalizing their PR strategies to score more sales. As reported by PR Week, several key initiatives are emerging this season. 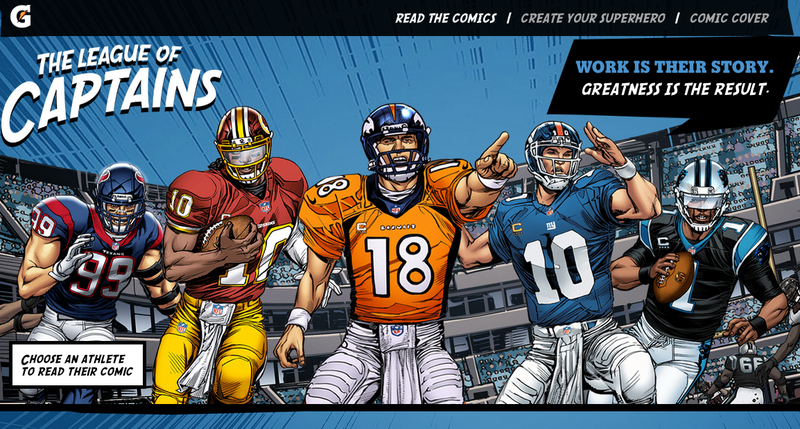 Longtime NFL partner Gatorade, part of the PepsiCo company, has launched a new League of Captains comic-themed campaign. The online comics will feature five football “superheroes”: Cam Newton of the Carolina Panthers as The Blender, JJ Watt of the Houston Texans as MegaWatt, Peyton Manning of the Denver Broncos as The Sheriff, the New York Giants’ Eli Manning as The Big Easy, and Robert Griffin III of the Washington Redskins as Triiiple Impact. In addition to appearing online, the heroes will be depicted on limited-edition Gatorade bottles. To further engage fans, the site will encourage them to customize their own superheroes and compete for a winning comic book cover. Social media is a big component of the campaign, as fans can share their avatars on Facebook and Twitter. This larger campaign comes on the heels of a smaller project the company conducted for Newton and Watt. Gatorade worked with DC Entertainment to create the League of Captains. FedEx is also gearing up for football season with a strong social and interactive strategy. In their FedEx Air & Ground Trivia Sweepstakes, the company will announce awards for Air & Ground NFL Players of the Week. Fans can vote to select the winning players and can then answer trivia questions about them. The company will also make a $2,000 donation to each winning player’s chosen charity. "[The players] take a lot of pride in winning because it’s a fan-voted award," said Patrick Fitzgerald, svp of integrated marketing and communications at FedEx. Another longtime NFL sponsor, Campbell’s Chunky, will continue to partner with individual teams and retailers to launch promotional events and charity programs. Megan Haney, manager of brand communications, said the company will be "focused on kicking off in-store and in-stadium activations across the U.S.” Among the planned events is Tackle Hunger, which will donate canned goods to New York food banks for every Bills tackle. A heavy social media and blogging presence will support Chunky’s campaigns. Chunky has also announced a new military-focused strategy. The company will donate proceeds from a special line of soups to benefit various military networks. Advertisers are also clamoring for spots on broadcast TV, according to Variety.